Geometric error measurements with traditional laser interferometers are generally complex, especially for measuring squareness errors, which require a 90° pentagonal prism. Developments in the aviation industry have made the machine tools larger and distances farther. These characteristics make the optical alignment of the measurement setup difficult. An autotracking laser interferometer (ATLI) can be used to assist engineers in shortening the inspection of time machine tools by approximately 50%. However, owing to the tracking function, the ATLI measuring result has minimal difference from the traditional laser interferometer. This uniquely designed interferometer is proposed in this paper for the geometric error measurement of machine tools or coordinate measuring machines (CMMs). This procedure involves the measurement of one line of an axis, and the measurement results provide information regarding the positioning and squareness errors. The experimental and simulation results show that when the linear positioning and squareness errors are generated simultaneously, the deviation first decreases then subsequently increases with the increase in test length. Hence, when the positioning error results, using ATLI, are applied to the compensation table of the controller in the machine tool, the engineer should check the result to determine whether the squareness is included too much to lead a not good compensation result. 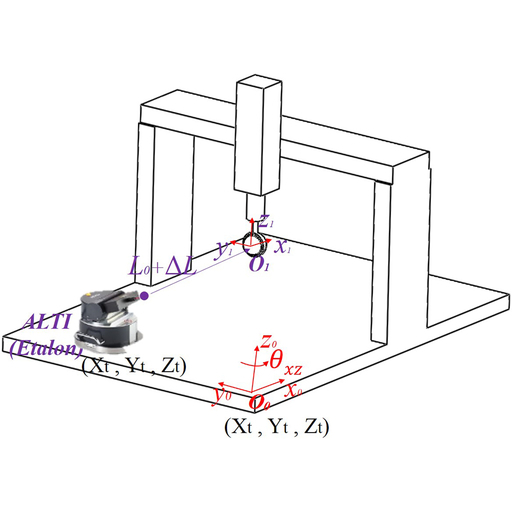 Jr-Rung Chen, Bing-Lin Ho, Hau-Wei Lee, Shan-Peng Pan, and Tsung-Han Hsieh, Geometric Error Measurement of Machine Tools Using Autotracking Laser Interferometer, Sens. Mater., Vol. 30, No. 11, 2018, p. 2429-2435.